​​​At the Annual Membership Meeting, you'll learn about AAIA efforts over the last year protecting sovereignty, preserving culture, educating youth and building capacity. AAIA members will vote for the election of a new Board member, Joseph Daniels, Sr., to sit on the Board of Directors. Members should RSVP for the meeting by 5 PM Eastern Time on November 9, 2018. Scroll down to RSVP. If you are an AAIA Member who is unable to join the meeting in person, please click here to provide a proxy for voting on the Board of Directors. 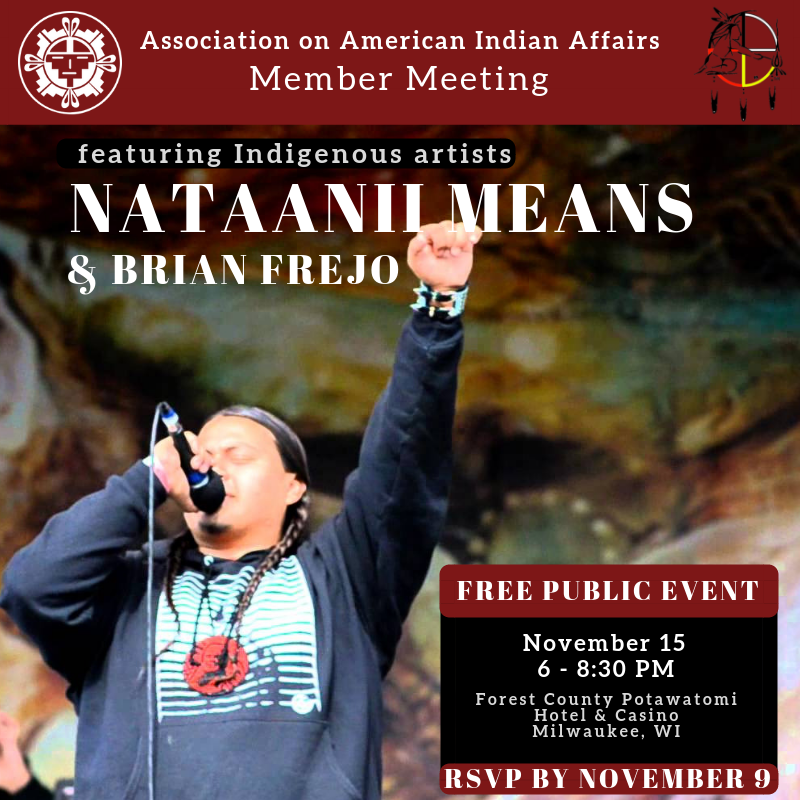 This year's event will feature a musical performance by Nataanii Means, an international hip hop artist, Indigenous rights activist and the son of American Indian Movement co-founder Russell Means. Joining Nataanii as performer and master of ceremonies is Grammy-nominated musician Brian Frejo (Pawnee and Seminole), who has reached thousands of Indigenous people as a motivational speaker, accomplished actor and advocate. This event is free and open to the public. RSVP below by November 9. NOTE: ALL AAIA MEMBERS MUST VOTE! If you are an AAIA Member who is unable to attend the Member Meeting in person, you must provide a voting proxy by logging into the Member Portal. Your username for the portal is your email address. If you have never logged into the portal, please follow instructions to create an account.